Sydney, 1978-79. Against the backdrop of the burgeoning inner city music scene, feedtime was formed. Taking notes from the incendiary live shows of X and Rose Tattoo, feedtime set about creating their own interpretation of the events unfolding before them, a blues-noise that was equal parts abstract minimalism and working class roots-rock. Post-punk, yet right in the thick of it; miles ahead of the pack and not many seemed to notice. The classic line up of feedtime (reunited on Gas) released 4 albums in the 1980’s before their initial dissolution in 1989. All four albums were licensed in the US, UK and Europe which generated the band an international cult following, held in high regard for their unique roots-racket and often cited as influential in the US regional band explosion of the early ‘90s. Fitting then, that in 2012 the band’s 4 classic albums were reissued as a box set by Sub Pop Records. The band reformed with a new drummer in the mid 90’s for tours with The Damned and Unsane (with whom they shared a split 7”) and an album on Amphetamine Reptile. Years passed once again before the most well-known line-up of the band reformed for a performance in San Francisco for SS Records’ anniversary showcase in 2011. A rarities compilation appeared shortly after and a US tour in support of the aforementioned box-set finally gave international audiences an evening with feedtime. 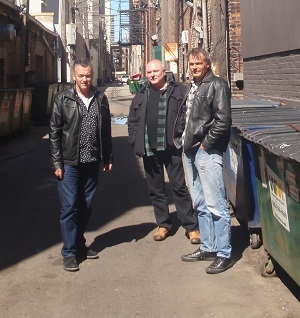 Gas presents all the elements which make feedtime one of the great Australian pub rock bands. The staggering, woozy slide guitar; the thundering drums and the relentless thrum of the bass create the atmosphere of urban panic up against finding ways to smile amongst the bitter, harsh reality of life and how you manage your own spirit with that of those around you. Some make it through, some don’t. Those who do should count themselves lucky, because it all comes down to luck, Jack. We’re lucky to have feedtime here and now. If there’s one thing these guys deliver, it’s a good time. Drink and dance and leave your problems at the door. Working all week to drunkenly stumble out of a Chippendale watering-hole, catching the blurry street lights, the sound of cars driving past on a wet road and how you didn’t realise it was raining because the band was so loud. It’s only Friday night. Never giving up. Always lowercase. Onward into the continuum. It’s a Gas! Listen back to Sunglasses After Dark on Thursday 22 June, 2017 for a live set from feedtime. Studio 5 Live is proudly brought to you by Mountain Goat.